A new report published by the City of Seattle shows that home internet access has become nearly universal, though some disparities remain. The study, which is the fifth in a longitudinal series for the city, is actually a model for how to do this kind of survey work. Nearly 50,000 invitations to complete a survey were sent out, with specific outreach to low-income households, Seattle Public Schools parents, and even “tiny house village” residents. 4,315 responses were received, which were then tallied and re-weighted to match the overall demographic and geographic distribution of the city. So what are the big take-aways? A tech icon and “Silicon Valley’s most feared and well-liked journalist” (New York Magazine), Kara Swisher is known for her insightful reporting and straight-shooting style. She is the executive editor of Recode, and the host of the Recode Decode podcast. Swisher is also the co-executive producer of the annual Code Conference, which brings together a global community of the biggest names in the business for in-depth conversations about the impact of digital technology. A visit from Ying Liu, in two parts! Ying Liu is an interdisciplinary time-based artist based in Brooklyn. For her first Seattle visit, Ying presents a workshop and a show & tell of her practice, with screenings of her films and excerpts of performances that fuse the mediums of theater, dance, video, and performance art. Her evening-length, hybridized works often mix consumer technology such as VR, GoPro and smart phones with DIY props and an exuberant sense of play. The diverse, multi-generational casts of her projects range from professional ballet dancers, sociologists, house music DJs, rappers, and filmmakers – sometimes all in the same performance. Highlighting the shifting, participatory nature of viewership, mediated in real time by our everyday use of technology, Liu’s practice reveals how experimentation is most fruitful when it escapes predetermination. Poking at the traditional boundaries between performer and spectator, she stirs together contradictory forces of memory, spatiality, and the inherent friction of sociality. HANG OUT: An NYC public park is the stage for a 3-episode play, where unsuspecting park goers become performers and audience members, in a medley of VR stations, fashion shows, friend circle drama inspired by the stock market, and line dancing. BREEZE: On the night of the Chinese Mid-Autumn Festival in 2013, Liu and another artist attempted to stretch a piece of silver string across the surface of Jacqueline Kennedy Onassis Reservoir in NYC’s Central Park. The idea was to create a gentle “breeze,” or to cut through the atmosphere of the water during a full moon. NOW WE START FROM THE ARM: A performance experiment in human knotting based on four prominent motions from the history of dance: push, pull, drag, and lift. DON’T BE SHY, MAN! : A hybrid show inspired by Stuart Sherman’s poetry, and oriented by a devotion to the infinite nature of artistic exploration and the modification of everyday objects to create alternative, non-utilitarian modes of being. YOU AND ME ARE STITCHED: For this film, Liu developed a novel tattooing animation technique and used it to meld digital karaoke text with 16mm live action footage. HAM OVER RICE: A mixed live action and animation film, deconstructing the Chinese myth of the god Houyi, an archer who saves the world but loses his immortality. TAILS: Liu makes tails as metaphorical containers for her tiny, trivial thoughts and creativity. I was born in Zhoushan Island China. Prior to moving to the States for grad school in film production at UT austin in 2007, I studied International Business Trading in China as an undergrad. Going to Texas was my very first time abroad. When I landed I realized that I was setting foot on a continent where I knew absolutely nobody. While at UT, by total accident I took performance art as my minor. That widened my horizon into art! I especially fell in love with Stuart Sherman’s work. So during summer vacations, I would visit Electronic Arts Intermix in New York and watch Sherman and other artists’ work in their viewing room. When I graduated in 2011, I relocated to New York. I work in an array of media: film and video, performance, new media, sound art, design, installation, textiles, animation and choreography. Historic arts organization Emily Harvey Foundation has presented my work in numerous sold-out solo showings including screening (O Ppl Prefer) Techshting A(ny)way, Don’t Be Shy, Man! – a hybrid show inspired by Stuart Sherman’s poetry, and evening-length dance performance Now We Start from the Arm. I am interested in jamming a large number of tiny thoughts into one work rather than beginning with a big idea. A method informed by my perception of the world. I trust that, with extensive layering, editing and sequencing, an order WILL emerge. And whatever that order might be, the work would come TOGETHER and further propel ITSELF into a system. By tattooing layers on top of each other, the found systems are able to find new meanings in their physical shape. Research plays an essential role in my work. And my background as a filmmaker has informed the way I “edit” and compose my audiences and foster an open and inclusive community through diversifying my performers and collaborators. In summer 2017, I staged HANG OUT, a site-specific, three-episode play in Manhattan Chinatown’s Sara D. Roosevelt Park, which had extensive use of VR. Because VR is based on environments, part of my research dealt with architecture and architectural models. MAKE A FOUNTAIN, a 302-page catalog accompanying and documenting these performances, was released in April 2018. The whole thing about parking on Capitol Hill being impossible is dumb. Paid parking zones have made open spaces mostly guaranteed during pay to park hours. Overnight parking and the insatiable human urge to not pay for parking that leads drivers to explore Capitol Hill’s more ticket-risky parking strategies — those problems are real. City living (and city news reporting!) with a motor vehicle pretty much guarantees parking tickets. It is the cost of doing business. Dubbed as “the world’s first robot lawyer” by its 19-year-old creator, London-born second-year Stanford University student Joshua Browder, DoNotPay helps users contest parking tickets in an easy to use chat-like interface. The program first works out whether an appeal is possible through a series of simple questions, such as were there clearly visible parking signs, and then guides users through the appeals process. The results speak for themselves. In the 21 months since the free service was launched in London and now New York, Browder says DoNotPay has taken on 250,000 cases and won 160,000, giving it a success rate of 64% appealing over $4m of parking tickets. Makes you wonder what other repetitive, mundane tasks could be taken on by a chatbot, no? In the meantime, there are other parking problems — and opportunities — on Capitol Hill to solve. Hat tip to @sleepylemur for sharing the news. In tandem with Mayor Ed Murray’s Digital Equity Initiative, Google is working to bridge Seattle’s digital divide with $344,000 in grants that will bring free WiFi to Seattle community centers and affordable housing projects. At least 15 percent of Seattle residents have no Internet service at home. Among Seattle’s lowest income residents and immigrant communities the numbers are even higher, according to the City of Seattle’s Technology Access & Adoption study. Through the grant, Seattle Housing Authority will provide internet to 800 very low income K-12 students and their families who live in SHA housing. The residents served by the project are among those whose studies show are the most technology disadvantaged and disconnected. The project will focus on providing connectivity to students in grades K-12 in the NewHolly, High Point, Rainier Vista, Lake City Court and Yesler Terrace communities. Google is also providing funding for WiFi at all 26 Seattle Parks and Recreation Community Centers, enabling access for public meetings and events, classes, and digital civic engagement and learning programs. The funding will also go towards the replacement of 31 outdated and obsolete computers at five RecTech Community Technology Labs – located in the Delridge, Rainier, Rainier Beach, South Park and Yesler Terrace community centers – which are used for digital literacy training and youth programs. 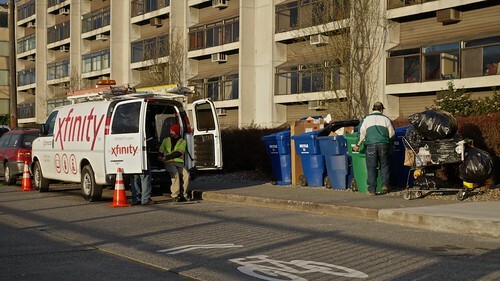 As part of the initiative, Comcast has dropped its prices for internet service for residents in public housing, KUOW reports. One element that won’t be part of the initiative’s thrust is municipal broadband. A 2015 touted by the mayor’s office concluded that the service was too expensive for Seattle to build without a private partner. You can read more about the Digital Equity Initiative here via seattle.gov. A “Cultural Innovation Conference” focused on Seattle’s Central District and Africatown returns to 17th Ave S’s Langston Hughes Performing Arts Institute this weekend. The 2015 Hack the CD Cultural Innovation Conference is a three day, all ages event held in Seattle’s Africatown – Central District, that convenes the brightest minds to participate in the New Economy through design, entrepreneurship, and technology. Do you own your own business or thought about starting one? We’re calling all all artists, authors, chefs, developers, designers, hustlers, and tastemakers to an entrepreneurial jam session! In one weekend, learn marketing and branding secrets from the pros, tips for new technology tools, and automation of your workflow to free up your time. Come with a new startup business idea or an existing venture. Geekwire covered the first Hack the CD event held last fall. For more information on attending, sharing experiences from your established Central District-area business, or volunteering, check out hackthecd.org. For Seattle to build a municipal broadband service, more than 40% of households would need to sign up to pay $75 a month for the service — a higher rate of penetration than any other municipal network in the country, according to a consultant’s report released by the City of Seattle Tuesday — or we’re going to need help. The report completed by Maryland-based Columbia Telecommunications says that it would cost Seattle between $480 to $665 million to build out the system that municipal broadband advocates believe would level the playing field with entrenched providers like Comcast and provide better service to the city. You can read the full City of Seattle Fiber-to-the-Premises Feasibility Study here.  It seems reliability of connection is the most important factor for business survey respondents, with speed and price of service close behind.  Most business respondents answered that they pay somewhere between $50 and $199 for their current connection.  Less than a quarter of respondents to the business survey claim that their Internet connection speed is fast enough for their business needs. The study also considered a tax-funded solution but the analysts found that it, too, would be too risky for the city to take on. IO House is The Real World: Capitol Hill. For nerds. Capitol Hill’s proximity to the silicon alleys of South Lake Union causes a great deal of concern regarding the Hill’s changing character. But tech entrepreneur Andy Rebele saw the intermeshing of the two neighborhoods as the perfect opportunity to fill an off-beat niche in Seattle’s tech community in a form that has been thriving for years in San Francisco. 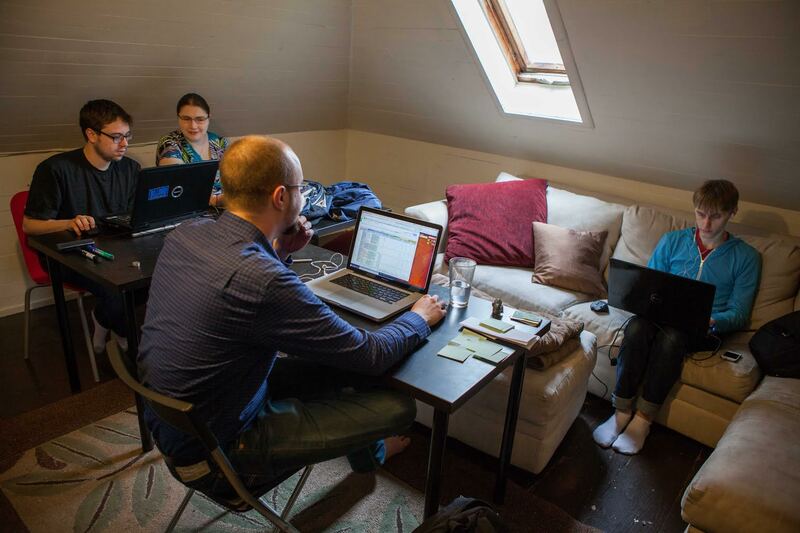 Last year Rebele and his business partner Andy Sack began renting a home in north Capitol Hill to open the IO House — a coliving, coworking space focused on fostering collaboration among tech entrepreneurs. Think guesthouse for creative, working people. Or, Real World Capitol Hill. For nerds. It is an electric-powered vehicle that is compact and innocuous enough to be allowed as a commercial flight carry-on, like a laptop. It is “green” and it is suitable and legal to ride on pedestrian walkways. You may have seen one spinning around Capitol Hill. “The Segway was supposed to be what this is,” says Capitol Hill’s Ted McDonald — better known as Barefoot Ted — of his sweet ride. Much of his life’s work and play has been particularly marked by themes of back-to-basics, human-powered transportation, but McDonald is now pushing things in a slightly different direction. The early enthusiast of barefoot running was featured in the 2011 book “Born to Run” and is owner of 19th and Prospect-headquartered Luna Sandals. He founded the company in 2010 and is listed as “Spokesmonkey” on its website. In his newest venture, rather than stripping away more recent advancements in athletic footwear, McDonald is helping promote some current reinventions of the wheel, positioning himself as one of the world’s leading spokespeople for a recently-developed iteration of personal transportation technology. McDonald says he thinks the emergent class of vehicles could significantly reduce many Seattleites’ reliance on cars, buses and bicycles, while also improving the quality of their commute, changing the equation and concerns in the city. Moreover, McDonald thinks the technology, like major advancements of the past, could bring major changes to life across much of the world.